Whenever we select a mutual fund to invest in or decide to continue with a certain fund we always give a lot of weight to the past performance of returns. In fact, most decisions are always made on the basis of returns. In order to enable investors to make accurate comparisons of schemes, SEBI introduced categorization and rationalization of mutual fund schemes in October 2017. This was done to ensure that an investor is able to take a more holistic and informed decision while investing in a particular scheme. Given the changes introduced by SEBI with regard to categorization of schemes, past performance would not be an appropriate tool currently. Due to the introduction of new rules, portfolios of the funds have undergone a change. Earlier, there was no standard definition to classify companies as large, mid or small caps. Each fund house would have its own criteria for deciding the same. For example some AMC could define mid-caps as companies between 101st & 400th rank of capitalization while some other AMC could have defined based on actual market capitalization, say between Rs.5000 cr to Rs.25000 cr. Also things like weather a large cap fund will have minimum 65% or 80% large cap companies could also vary from AMC to AMC. This would lead to huge differences among the definitions of various AMCs and comparing two funds from the same category would also sometimes result in an apple to orange comparison. As per the new categorization rules, top 100 companies, in terms of market capitalization, are considered as large caps, the 101st to 250th companies will be considered as midcaps and the 251st onwards will be considered small caps. Along with this, SEBI also laid down minimum investment criteria for large, mid and small companies. Any large cap fund has to maintain minimum 80% portfolio in large cap stocks. Similarly small cap/mid cap fund is now mandated to maintain 65% of its portfolio in small cap/mid cap stocks. This brought changes in the portfolio composition of several funds. 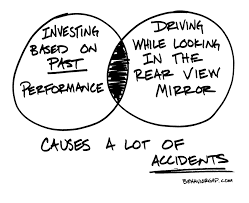 Another reason why past performance is not relevant now is due to the change in fundamental objective of the funds. Post SEBI’s re-categorization norms, ‘fundamental attributes’ of many schemes underwent a change. For example the erstwhile ICICI Prudential Indo Asia Equity Fund has been changed to ICICI Prudential Small Cap Fund. Earlier the fund could invest in the equity of companies from any market cap and also could actively invest in the equity of the Asia Pacific region. Currently, the fund manager has to maintain at least 65% domestic small cap stocks in the portfolio. This would also be applicable with a lot of funds which were merged with each other as discussed below. In order to reduce confusion among investors, SEBI laid down a new rule permitting only one scheme per category. As a result, many fund houses which had multiple schemes in one category had to merge some of their existing schemes or close one fund. For example, HDFC Mutual fund had two tax savings funds namely HDFC Tax Saver Fund & HDFC Long tern Advantage Fund. Currently they have stopped taking fresh investments in HDFC Long term Advantage Fund. They also had two balanced funds namely HDFC Prudence Fund and HDFC Balanced Fund. HDFC Balanced Fund merged with HDFC Premier Multi Cap Fund and got renamed as HDFC Hybrid Equity Fund but it remained in the Balanced Fund (Aggressive Hybrid) category. On the other hand, HDFC Prudence Fund and HDFC Growth Fund were merged to create HDFC Balanced Advantage Fund. This fund now belongs to the Balanced Advantage category.This is a major change as the investment mandate of the fund changed from equity-oriented balanced fund (i.e. equity exposure in the range of 65% to 75% and the rest in debt) to dynamic asset allocation fund (i.e. equity or debt exposure can now move between 0 to 100%). Existing investors have to check that the reclassified schemes in their portfolio are in line with their risk profile and investment goals and take action accordingly. New investors need to go beyond past performance and give much higher weightage to other analytical aspects or take expert opinion of wealth managers/financial advisors.